// Template for a Kubernetes (service, deployment) pair. // Optional arguments for this template. // for more information on defining services. // for more information on defining deployments. // Wrap up both the service and deployment in a Kubernetes resource list. // The cluster manager deployment for foocorp. 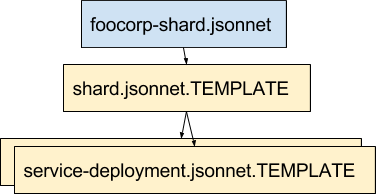 // The webapp deployment for foocorp.